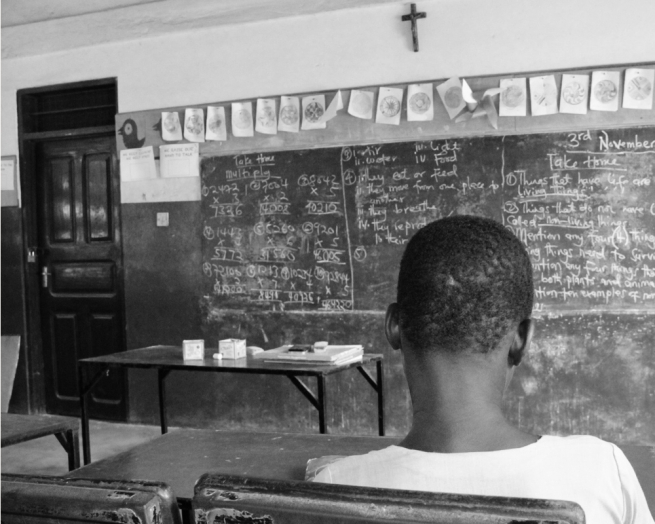 (MissionNewswire) Salesian missionaries recently celebrated 25 years in Ghana. The first missionaries arrived in 1992 in Sunyani and soon became known for their educational work, especially for at-risk children and victims of trafficking. Children face extensive hardships from being exploited in child labor to being sold by their relatives, often to pay off some debt. In the Lake Volta region, it is estimated that there are approximately 21,000 children and teen laborers who have been prevented from attending school. Concerned, Salesian missionaries launched the Child Protection Center. Children come to the Child Protection Center from referrals from other nonprofits and from the police, usually following a complaint. The center offers shelter, counseling and education to help children make the transition out of trafficking and into long-term recovery. Often arriving at the center injured, with low self-esteem and little hope for the future, many become comfortable and settled into their new surroundings within a few weeks. Academic classes are offered in the morning after which students are able to participate in group activities with their peers such as theater, music, dance, sports and games. Through the program, participants learn life skills, gain confidence and prepare for a happy, healthy future. Today, there are 52 youth at the center—46 boys and 6 girls aged 7 to 17. Emmanuel is 11 years old and today living at the Child Protection Center. He is not different than other boys his age at the center. His mother separated and left with another man, leaving the family without support. Emmanuel was sent by an aunt to the Lake Volta region. Once there, little by little, he stopped going to school because his uncle used him for work, carrying water during extremely long days, and treating him badly. When he came to the Child Protection Center, Emmanuel was aggressive and did not pay attention to the rules and structure that was provided. Gradually, however, he is overcoming the traumas he suffered and is making friends. Now he is happy to go back to school and wants to learn. Like all boys his age, he has a dream. He is studying hard to one day become a bank manager. The center is part of a collaboration between missionaries, the local police department and Ghana’s Ministry for Social Welfare. While Ghana’s economy continues to improve, nearly 45 percent of the population lives on less than $1 a day, according to UNICEF. Ghana ranks 135 out of 187 countries on the United Nations Development Program’s 2011 Human Development Index, and rural poverty remains widespread in the dry savannah region that covers roughly two thirds of Ghana’s northern territory. Small-scale farms suffer from a lack of infrastructure and equipment, both of which are needed to shift from subsistence farming to more modern commercial farming which would yield greater incomes and a chance to escape poverty.